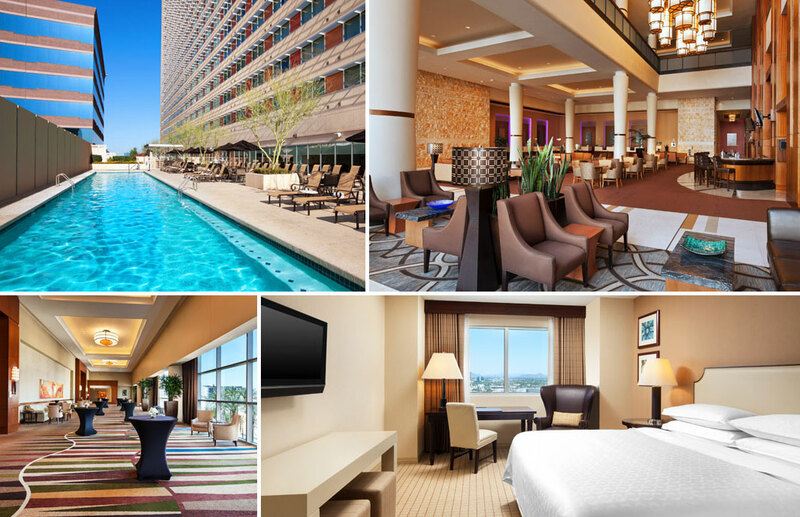 The award winning 1,000-room, 1.2 million square-foot Sheraton Grand Phoenix is located in the center of downtown Phoenix, minutes away from the Phoenix Civic Plaza, light rail, and the Sky Harbor International Airport. Onsite amenities include a 4,000 square-foot state of the art fitness center and a 2,000 square-foot roof top outdoor pool, sundeck, and pool bar. The hotel features over 100,000 square-feet of flexible, state-of-the-art meeting space including a 30,000 square-foot ballroom and a 15,000 square-foot junior ballroom. In addition, there are 14 meeting rooms, 2 high end boardrooms, and recently upgraded rooftop outdoor meeting spaces with amazing views of downtown Phoenix. All of the meeting facilities incorporate high speed internet access and videoconferencing capabilities. The Sheraton Grand Phoenix also consists of a destination restaurant and lounge with al fresco seating, spacious lobby bar, and a full service Link by Sheraton Cafe. A 500 space underground parking structure was also incorporated into the project. The project was completed ahead of schedule and approximately $4 million under budget – allowing the client to use the remaining funds for future project enhancements. More recently, TynanGroup acted as Project Manager for the construction of the highly successful Breeze rooftop bar, a first for the City of Phoenix, as well as conversion and upgrade of 11,000 sf of high-end indoor and outdoor roof top meeting space.